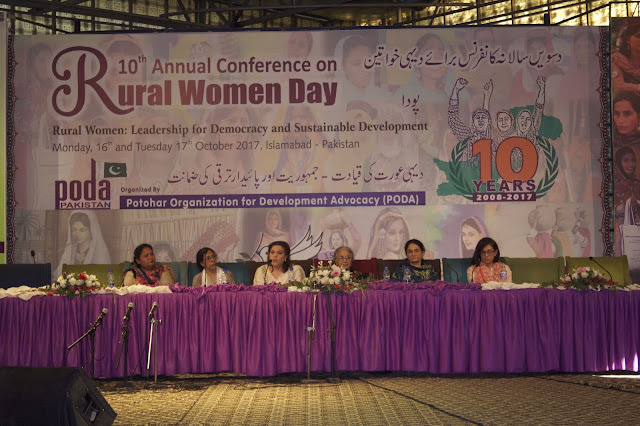 This and more was the theme of a policy dialogue on health and nutrition at the 10th Annual Conference on the International Day of Rural Women organized by Potohar Organization for Development Advocacy (PODA). The discussion, sponsored by National Commission on the Status of Women (NCSW) and Leveraging Agriculture for Nutrition in South Asia (LANSA) sought to raise the issue of recognition of women agricultural workers. It discussed the impact of their work on their own health and their children’s nutrition. The panel, chaired by Chairperson National Commission on the Status of Women, Ms. Khawar Mumtaz and co-chaired by Executive Director PODA Ms. Kaukab Jehan, featured Ms. Akeela Naz (Member, Anjuman Muzareen), Dr. Huma Qureshi (Public Health Specialist, National Commission on the Status of Women), Ms. Benazir Jatoi (Lawyer and activist) and Ms. Sabiha Nazeer (Member National Assembly, PML-N) and was moderated by Mr. Haris Gazdar. Three-quarters of Pakistan’s female workforce is employed in agriculture. Activities such as cotton picking and livestock care rely particularly on women’s labour, but their toil is not recognized as work by the government, employers, communities, families or the women themselves. Akeela Naz said that despite undertaking much of the livestock work, and being responsible for producing nutrient rich foods such as fresh milk, the diet of a rural woman remains severely inadequate. Pakistan’s key cash crops - cotton, sugarcane and wheat - are primarily dependent on the labour of female agricultural workers, but these women do not benefit from their income. Ms. Sabiha Nazeer concurred, saying that many women agricultural workers have no agency over their income, and the money is spent by the male members of their family. According to her, women’s work including farm work, domestic work and even embroidery work is not recognized as (paid) work by the male members of their households. She reinforced the fact that the work done by women agricultural workers is by far greater than what the men in rural areas do and perhaps getting them represented in the Kissan Board will begin the process of recognition of their rights by the state. Dr. Huma Qureshi said that one of the reasons for such poor nutritional indicators is women’s own lack of concern about their health while prioritizing their family, especially their children. Women must prioritize their wellbeing. Benazir Jatoi highlighted the need to step back and think about the underlying causes that limit the protection of the rights of women and children. In her opinion, the issue exists because the Pakistani state still has yet to recognize women as equal citizens. Even though our legal framework – the Constitution of Pakistan, and international conventions make special mention for provisions for women and children, little has been done when it comes to implementing their rights. Women in both urban and rural areas face ‘poverty of time’ by constantly trying to balance their responsibilities within the household such as taking care of elders and children, doing domestic chores, and working outside their homes. When faced with the time trade-off of working for the household or taking care of themselves and their children, women find themselves facing a harsh choice. There is need for laws around basic family training where both men and women have the same agency. She highlighted examples from other countries where the state has played a more active role in recognizing its female agricultural workforce, such as India where women are included in the definition of farmers. To ensure the health and wellbeing of majority of Pakistan’s female workforce, it is important to legally acknowledge their contribution by recognizing their rights over their incomes. “Every woman should be recognized as a farmer, and be paid minimum wage similar to that of a skilled worker” said Ms. Mumtaz. In her opinion, the next general elections provide an opportunity for party workers to include this demand in their manifestos and invited all partners to come together to create a rural women manifesto that would look at women equally in the rural and urban context. The conference resolution adopted these demands for recognition of women agricultural workers as farmers and labourers and called on the government for gender sensitized programmes and policies across all sectors. To realize these objectives, we need all partners including government, legislators, activists, researchers, donors, media and the civil society to come together to ensure that women in agriculture are given their due recognition. To facilitate this, LANSA Pakistan aims to build a network of partners that work jointly on a sustained basis to further this agenda and champion the cause. To join the network or learn more, please reach out to LANSA Pakistan at researchtoaction@researchcollective.org or +92-21-34551482.